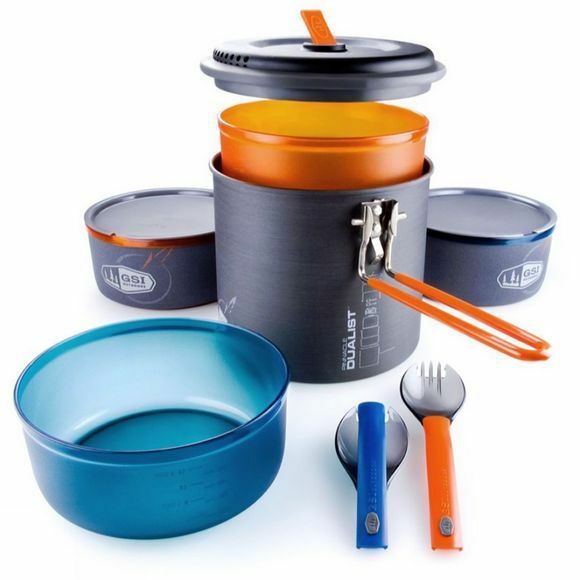 The Pinnacle Dualist Cooking Set from GSI Outdoors, is an award-winning compact kit that is the perfect, all in one cooking and eating solution for backpacking trips. The kit ranges from bowls and pots, to mugs and sporks(fork/spoon). Clean up is a breeze because of the Teflon Radiance non-stick technology on the pots, bowls and mugs. Through clever design, all the elements collapse into one another like a Russian doll, making storage simple and it packs away neatly into a stuff sack that also doubles as a sink.